It’s hard to believe that the spectacle the world just watched on the Olympic slopestyle course was only a warm-up, as thirty top skiers duked it out for a precious 12 spots in the Men’s Ski Slopestyle Final. We saw absolutely crazy combos and transfers in the rail section, like Elias Ambühl’s bomb-drop to down rail, Fabian Bösch’s gap to goalpost rail, and a massive disaster to the high down rail in the third rail tier, which no one else has even looked at, from Teal Harle. And we saw big fireworks in the jumps, where double cork 1260s began to look absolutely ordinary as the competitors packed out their 1440s, 1620s and triple corks. After the first run Switzerland’s Andri Ragettli led the pack, followed by American Nick Goepper and Englishman James Woods, all of whom tossed triple corks in the jumps. 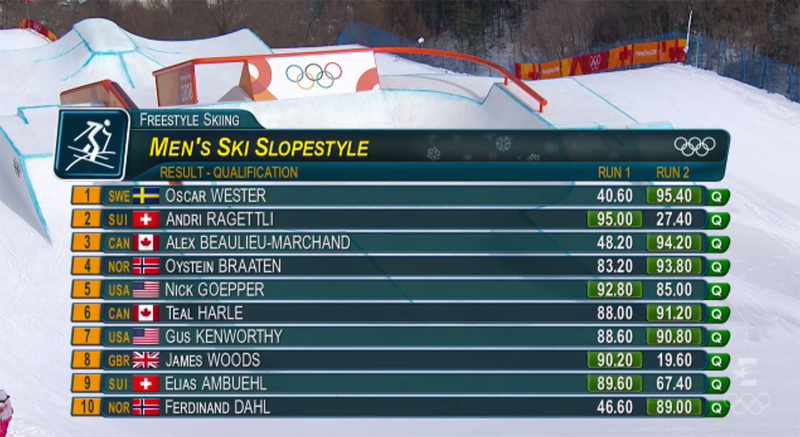 But even more big scores rolled in on the second run, as Sweden’s Oscar Wester posted a new high score of 95.4 to take the top seed, while Canadian Alex Beaulieu-Marchand stomped his innovative run to slide into the third qualifying spot. Wester stomped a strong if conventional rail section before sending it massive in the jumps, launching a double cork 1440 to the bottom of the first jump and following up with a huge side-hit double cork 900 (kangaroo flip) on the second jump. -Henrik Harlaut, the man many expected would win this event, failed to qualify. He crashed on the first jump in run 1, and although he skied out his second run, even tossing a switch triple, small mistakes kept him from breaking the top 12. -Swiss vet Elias Ambühl pulled a crazy run out of nowhere, bomb-dropping onto the first down rail the snow platform to the left and then 450ing out. He nailed the rest of the run for a ninth-place seed. The Swiss have three riders in the finals: Ambühl, Bösch and Jonas Hunziker. -Tasei Yamamoto of Japan deserves a shoutout for bringing some infectious energy and freaky style to the course. He pretzel 270ed the whole down-flat-down rail, brought back the bow-and-arrow grab in a big way in his switch double cork, and might have yelled “Bonzai!” while dropping in to his run. Now that’s some stoke. -Teal Harle dropped a bombshell second run, landing an insane disaster gap in the rails before taking the extreme high line off the skewed kicker on a monster double rodeo 1080. Harle qualified sixth. -Felix Stridsberg Usterud, who narrowly missed the finals in 14th place, still dropped a beauty of a double front flip superman for the crowd. If this were crowd-voted, Felix, you would have won! -Jackson Wells wasn’t able to put down a run, but tossed in a few zero spins in tribute to his brother Jossi. The Men’s Slopestyle Final begins today at 5:00AM CET, and it should be a hell of a ride.